"Will they lead the same sorry lives as we have? Don't become miserable apple-polishers like me, boys." I feel like everytime I review an Eclipse collection, I should be offering profuse thanks to Criterion for putting out such uncommercial properties, and this collection of silent comedies directed by Japanese master Yasujiro Ozu is no exception. 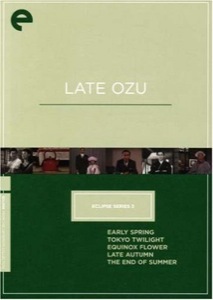 The previous Ozu collection issued by Eclipse was an easy enough sell, containing as it did some superb films that possessed some small measure of cachet in the marketplace, but this three-disc set is another thing entirely, dealing with silent films (always a tough sell in this day and age) and films that occasionally look pretty rough, which those interested in pristine, detail-laden images will shudder to see. But missing out on these films would be a shame, as they show the rise of the Ozu we would come to know in his sound work, dealing with issues of family and its functioning in modern society. First up is Tokyo Chorus (01h:30m:34s) from 1931. Father Shinji (Tokihiko Okada) works as an insurance salesman whose interest in standing up for a fellow worker sees him fired. His attempts to find another job and the subsequent drain on family finances causes friction, especially with his son, whose dream of a bicycle hinges on dad's bonus money. The issue in the film becomes Shinji's unemployment, and the strain it causes upon the family, not only in financial terms, but also on self-image. When Shinji's wife Emiko (Tsuma Sugako) sees Shinji carrying an ad placard, her shame is palpable. The economic times being what they are however, leave Shinji no choice. The promise of a potentially good job coming from that (he does the work for his old schoolteacher, now a restauranteur) outweighs the societal costs. If the film has a problem, it's that Ozu never goes far enough in showing the desperate straits they are presumably in; I never felt that things were on the verge of collapse. Shinji's travails are simply a bump in the road, and things will work out in the end, which indeed they do, and in a typically Ozu fashion, feature a gathering of school chums having a reunion. The next film up is I Was Born, But� (01h:30m:31s), from 1932. This film usually is referred to as the inspiration for Ozu�s later, much better known Good Morning, but that doesn�t mean this is a lesser project at all. Here, two boys (Tomio Aoki and Hideo Sugawara) adapt to a new neighborhood and the kids within it, while their father tries to gain favor at work. When the boys' world and the father's world meet, the boys learn some important lessons about how the real world works. That description makes it sound fairly corny, but the film is anything but, being attuned the rhythms of childhood and the ways in which adults miss what seems obvious to kids. There's a bittersweet element to the film, in the way that the boys face up to the world not matching their view of it, but this is a warm-hearted film with excellent performances and shouldn't be missed. Finally, 1933's Passing Fancy (01h:40m:18s) revolves around father and son relationships again, with single dad Kihachi (Takeshi Sakamoto) and son Tomio (Tomio Aoki) scratching out an existence. When Harue (Nobiko Fushimi) enters their world, the smitten Kihachi must compete against good friend Jiro (Den Obinata) for the young woman's affections, and Kihachi's failure to win Harue leads to complications in his and Tomio's lives. The conflict allows Ozu to explore both familial and social relationships in a sometimes subdued, sometimes melodramatic way, but it all ties together thanks to Sakamoto and Aoki's winning performances. It's maybe the "least best" of the films here, but it succeeds regardless. Image Transfer Review: That many Japanese films from this period survive at all is something to be thankful for, and quibbling about the relative quality of the images on display in this set is more or less a dead end; these films look as good as they'll likely ever look, and we can either accept it or choose something else to watch. The three film included are in fairly rough looking at times, but all are watchable and no one should be scared off by the less than pristine quality of the images. The transfers themselves are fine. Audio Transfer Review: You have the option of watching the films either with or without new scores composed by Donald Sosin, and each serves its given film well, sensitively capturing mood and emotion. Extras Review: Per the Eclipse model, extras are limited to brief essays on the reverse of the disc covers. Even if you don't like foreign and/or silent movies, you should be won over by the charm exhibited in these three films, all superb, from director Ozu. The transfers are fine of problematic material, and the Eclipse model means no real extras, but the films shine plenty on their own.